Established back in 1983, Love Island Travel & Tours Ltd, because of the passion and love for travel by its staff, managed to become one of Cyprus’ leading Travel Agencies. Furthermore, the company is now an official Disney Representative, providing great custom made holiday packages to suit any taste! We love travelling ourselves, so, when this project was first initiated, we proceeded with great enthusiasm and dedication, following months of hard work and preparation. From design to development, we believe that our client’s needs and expectations were met successfully, yielding the result of a fun, vibrant and interactive website. One of the technical challenges that lay ahead, was the development of a complex calculator tool that would be able to calculate the cost of travel packages accurately, based on many different variables. This requested element now makes it easy for the website’s visitors to find out the exact cost of their holiday for accurate programming. 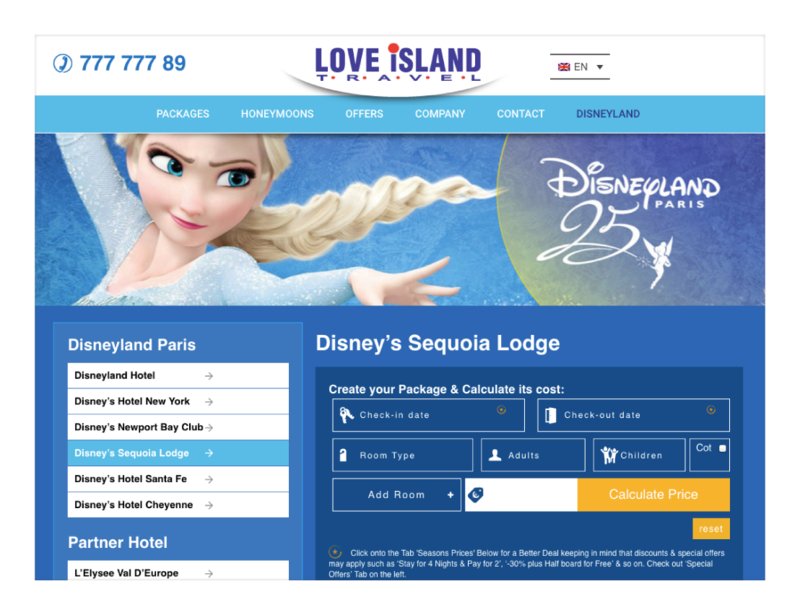 Thank you Love Island Travel for choosing Web Theoria!